In the UK, a “turf accountant” is a bookie. Bookies are often viewed as shady characters. The UK also distinguishes between “certified” and “chartered” accountants. The latter enjoy the highest status and are viewed as honourable individuals because of their vows of probity to the Crown and membership of a discerning organisation. I can deal with not understanding math or the universe. But for some reason, few things frustrate me as much as when I don't get a joke. few things frustrate me as much as when I don't get a joke. Me too. But really ... I trust that's not your reason for being up at four ay em! What was the source of that cartoon again? Maybe the context will help. Make that 3 am this morning. I'm something of an insomniac. I found it on a message board in a very old thread. Everyone thought it was hilarious, but it was an old thread so none of the people who knew why it is so funny were there anymore to explain it. There was no other context in the thread that could explain it either. Then I suspect it to be an in-joke of sorts. Unfortunately the best jokes often are! Solidarity brother. Previous night my mind was whirring until about 5am. Last night though, sweet dreaming. You may be looking for a secondary level of humour that is absent. 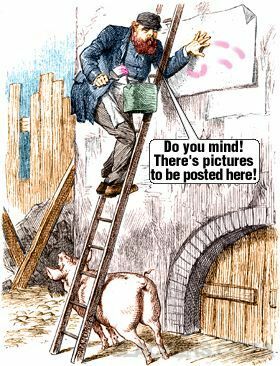 Some people, especially children, could find the mere fact that the guy on the ladder is explaining to the pig why it should not bump against the ladder funny. Yes, but presumably the joke is also funny in itself. Unless perhaps the folks on the message board deliberately changed the caption in the speech bubble in order to fit in with the in-joke. Perhaps there was something else there originally. It could be a kind of meta-joke. The game “Mornington Crescent” is like that and confuses the bejabbers out of the uninitiated. The game has one simple rule: Name any London tube station you like and fabricate any ad hoc reasons, rules, strategy and/or precedent as needed to “justify” your call. The more obscure and fanciful, the more plausible. The first person to name Mornington Crescent wins, but other initiates usually contest the call hotly, again on entirely made-up grounds, and the call is often withdrawn as a result. In this case, the cartoon isn’t really funny and was never intended to be. The actual joke is that those who are in the know pretend that it is unspeakably hilarious only to confuse the uninitiated but perhaps more to try and catch out those who aren’t in on it and who say it’s funny. I guess it's got something to do with posting pictures on a forum, but I don't get the joke either. Using Google's reverse image search, I found that the picture originally didn't have a speech bubble. That was added, thus it probably is some sort of in-joke. Page created in 0.64 seconds with 24 sceptic queries.